Some of the most crucial roles in our society are performed by health practitioners, workers in protective services, and members of the armed forces. Doctors, nurses, service members in the military and paramilitary, firefighters, other first responders and paramedical professionals, police and many more face difficult occupational challenges and must also deal with the challenge of work schedules that are often unpredictable and undesirable. Often, the important work requirements of those in the demographic necessitate shift work schedules and prevent them from realizing the benefits of good sleep. This is and should be a cause for concern for these individuals and it raises questions as to the effects of shift work on sleep and health. People who perform shift work or those who have erratic sleep schedules due to overnight, changing, and unpredictable work hours may notice the toll this type of work takes on individual health. Additionally, the types of workers and work schedules that fall into the category are vast in number. The defining characteristic for shift workers is anybody who does not work a regular 9-5 shift, as described by the National Sleep Foundation. 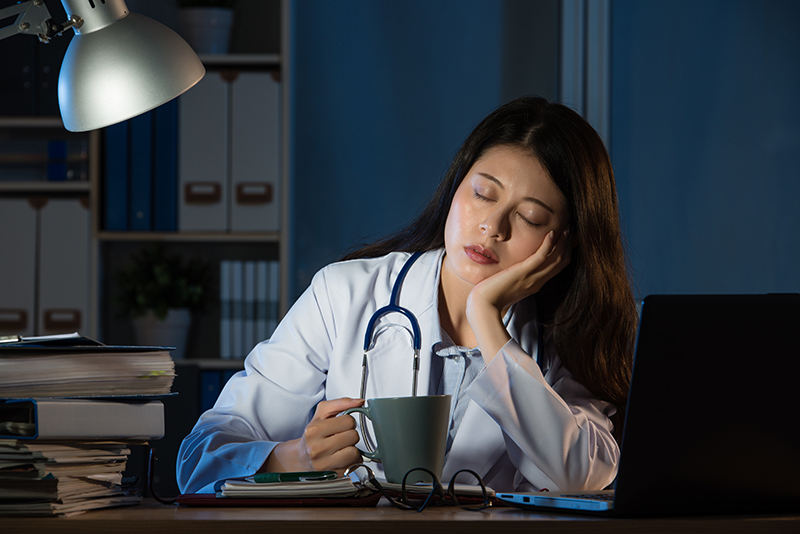 The question of how to mitigate the effects of poor sleep on health is an important one to address (read Tips to Mitigate the Effects of Performance and Sleep Decline Associated with Shift Work). How to get enough sleep when working the night shift is a daily question for millions of Americans. What side effects do shift workers typically experience? Shift workers suffer from fatigue, sleep deprivation, sleeping disorders like insomnia or sleep apnea, and increase their risk of developing other health problems. Many of these issues stem from the disruption to circadian rhythm. Working for a living in these occupations comes with risks and disadvantages. Lack of sleep and the negative impacts this has on health is one of the occupational hazards. The unfortunate reality for those in occupations requiring shift work is that the effects on disrupted sleep are indeed harmful to individual health. The body’s biological clock and circadian rhythm, which control clock dependent alerting and the body’s sleep drive, do not function as normal when you are awake at night and sleep is needed during the day. The changes the body faces when these systems are distorted are great and can lead to many serious short- and long-term health concerns. If you aren’t getting enough good sleep, you put your physical health at risk and may see weight gain and fatigue as short-term consequences, and long-term health may be affected as well. There is a strong correlation between shift work and the development of conditions like obesity, cardiovascular disease, diabetes, ulcers and other stomach problems, and depression. Poor sleep’s effect on individual functioning also extends to having direct harmful effects on family and social life, performance at work, and other daily activities like driving, that can have dangerous consequences to the driver, other people in the vehicle, as well as other motorists on the road. What can shift workers do to compensate for poor sleep? Some solutions that shift workers have found to compensate for lack of sleep because of an irregular sleep schedule include napping, diet and exercise, guided meditations and mindfulness training, as well as utilizing sleep aide systems to improve the quality of sleep that they get, when they can get it. These tools can help mitigate the harmful effects of a poor sleep schedule, but they do not cancel them out. Getting good sleep is an important component to overall health and wellness. Sleep plays an essential role in metabolic rate and body composition and sleeping at the right time’s aids the body’s ability to regulate important hormones that control mechanisms like metabolism and insulin sensitivity. These mechanisms and more are responsible for day to day healthy functioning that impacts numerous areas in life. For those considering occupations requiring shift work or for those who already work these types of schedules, planning for a future with more regular daytime work hours may be crucial for maintaining a healthy lifestyle.